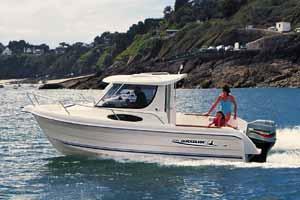 Boat Description Quicksilvers Weekend range of spacious boats will take you out to the fish quickly and safely. Or if you prefer your boating pleasure with all the family, these are roomy boats with sturdy protection from the weather.The 635 is one of the most comfortable boats you could find. The cabin layout makes this boat an excellent choice for the week-end fisherman who wants more comfort.